Home Blogging Tips The Best Blog Conference I Have Been To. Period. I have been searching for the best blog conference since I started blogging. I started blogging three years ago, and in that time I have been to a few blogging conferences in hopes to learn something to better my blog, my business, and to help hone my new-found craft. Most times I have come home disappointed for the time it took away from my family versus the information that I gained. I step back and think, was the exchange worth it. Almost every time the answer has been no. Now, I am not saying these conferences that I was disappointed in are not worthy for others to go to. I just feel at the level I am at, I have already learned everything in the sessions. Now, I always find a small gem to take home with me, or I make it a point to connect with a brand face to face. I always try to find some positive in all of my situations because it is a better way to live. Anyways, this post is not about what I have not found BUT what I have found. I finally found the best blog conference, a conference for women (and men) in our space where I actually learned something. Not just a tidbit or a small gem either. I learned LISTS of things to do which made me NOT work while I was at a conference, but (gasp) pay attention and take notes. I even bought three books at the suggestions of the speakers and bought a book for my employee out in the hallway. I talked with my writer and was excited about the changes that I was going to make on the back end of the blog. I started to evaluate what I have done and took notes on where I wanted to go. I learned valuable information on taking the next step, visualizing the next step, and the importance of Why Not Now? I learned new things about SEO, Google +, Instagram, Pinterest, selling your pictures, and more…all next level , beyond the basics stuff. The good stuff worth spending your money on. The good stuff that will make you money in return. A sound investment for my business. The speakers (mostly Tiffany ) were heartfelt, beautiful women (inside and out), which exuded sincere emotion you could not help but share. They were all fantastic speakers. Funny ladies who are just like us (except for the two fellas), moms who are business owners, just like me. Fran and Tiffany did a fabulous job with this conference, and if you have not heard of them, you need to check them out right now at The Sits Girls and join them at Massive Sway (where you can earn money blogging). 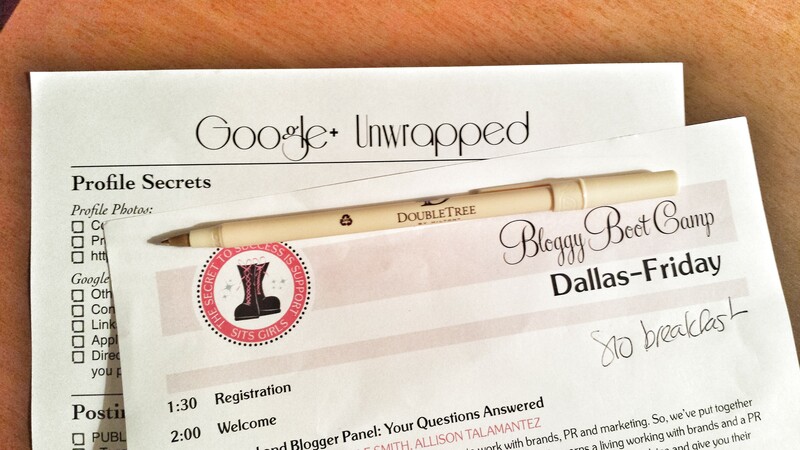 They have a few conference tracks, but the one I went to was the Bloggy Boot Camp, Brand Edition. I am looking forward to see what Women Get Social the older, cooler sister to Bloggy Boot camp will be all about, and I look forward to checking it out in 2014. During the last session, Tiffany Romero and Danielle Smith talked about the importance of powering down. This session resonated the most with me. Sleep is important. Family is important. Time is precious. Don’t miss out on your kids accomplishments, your date nights, and home runs because you had to send a tweet or check Facebook. Danielle and Tiffany said something, I am totally stealing as my life mantra. I am setting myself up for success. I will never find the balance I am trying so hard to achieve. The idea of “balance” in my life is a myth. I am a juggler. I cannot balance being a stellar mom and being a stellar business owner. I CAN, however, do one thing at a time and be present in the moment I am wearing that hat. I am also allowed and expected to drop a few balls and not be perfect because that is what jugglers do. I am not going to wear a pointy hat with jingle bells on it, but each ball I throw up with be thrown with care, knowledge and love. What has been your favorite conference you have gone to? Why?